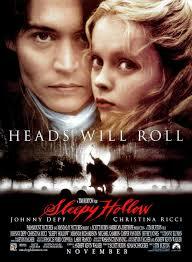 Another film I originally saw a long way back, this may have been the first live-action movie I saw Johnny Depp in. Although violent and very gory in places, I still found this as entertaining to watch as I did the first time I saw it. I thought the atmosphere of this movie was really good. Ichabod Crane was a character who was easy to relate to and it was good to have the opportunity to learn more about his past. I liked the fact that there were flashbacks to him as a child, which meant that his history was revealed gradually during the movie… but it made sense to have him more concerned with science than any kind of supernatural/paranormal. The Horseman was a particularly scary villain, especially in the flashback where he seemed more like an animal than a person. It was good that there was an air of mystery to this movie, though. It was dark and Gothic, but I felt that it also allowed me to get to know some of the characters particularly well. I recognised Christina Ricci from various other things and I thought she made a good Katrina. I did, however, think that I didn’t get the opportunity to know her as well as Ichabod. It would have been good to learn more of her past and how she became interested in certain things. There were a couple of amusing scenes in this movie, particularly in seeing Ichabod trying to apply logic to a supernatural case. He did seem to faint an awful lot, but I did also think he came across as a fairly capable Constable. It seemed to be quite hard for him to come into a small town where superstition was rampant. There were other actors I recognised in this movie as well and it was good to see them in a more historical piece. There was a lot of tension in this movie and I did care about the plot and the characters. There was some attempt to give the villain a backstory and I liked that element, too. If you like horror, I think this film is fairly good. Although it is kind of part of the slasher genre, I did find it entertaining and the characters easy to follow and root for. It’s an older film, but sometimes those can be better, particularly when it comes to portraying relationships between characters.